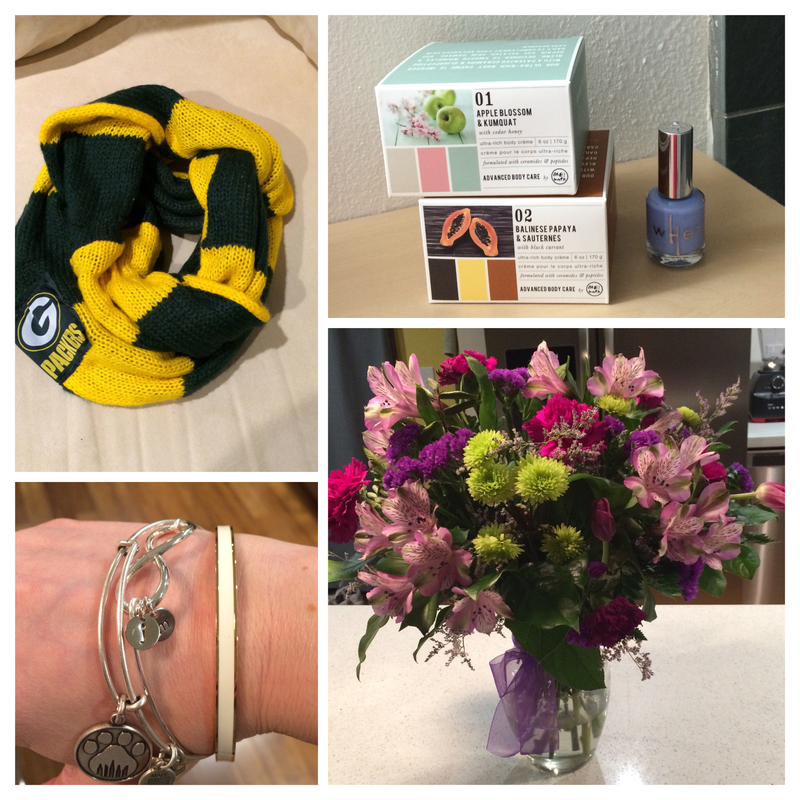 Last week was my birthday, and I was showered with beautiful gifts! I thought I would share some with you, just in case anyone wants to add them to their wish list! Starting with the bag: Coach Scout Hobo. This beauty was a gift from J. I have been looking forever for a pale yellow handbag and everyone at work is super envious. Between this and my puppy, I am not really even safe to leave my desk anymore. I can’t begin to imagine where this adorable bear dish came from, but I got it from my dear friend K, and I put it on my bookshelf and filled it with my bracelets. I adore bears, so this is perfect! 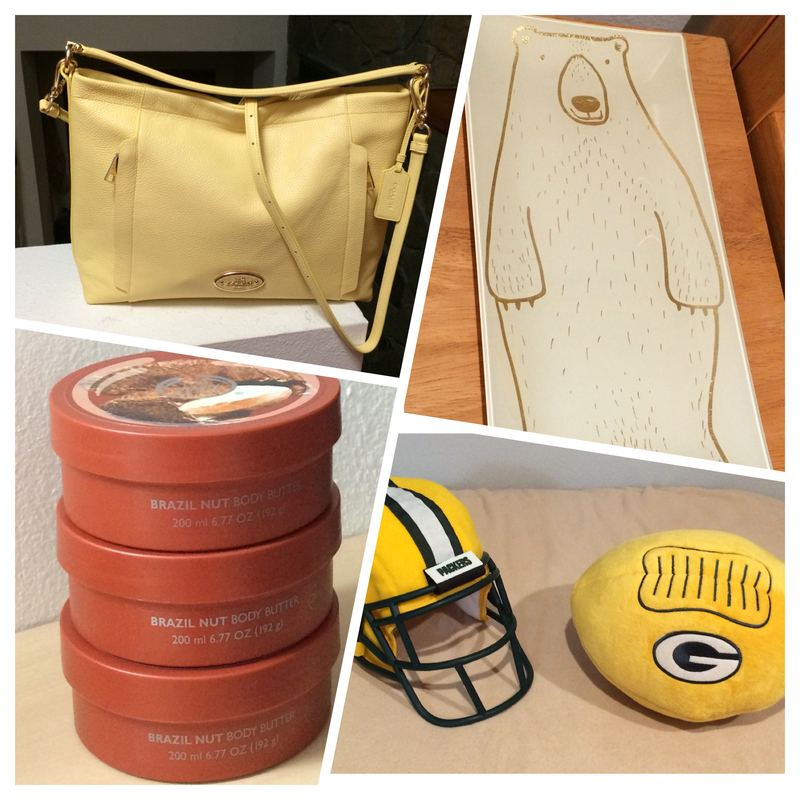 A bit of Packers gear from J. The soft helmet was my good luck charm through most of last weekend’s game, but it couldn’t hold out through the end 😦 This plush football folds out and becomes a cow!! Super fun! The last picture is three of the same body butter- Brazil Nut from the Body Shop. Panda gave me a gift card, and I stocked up. I adore this scent, sometimes I open it and just breathe it in. 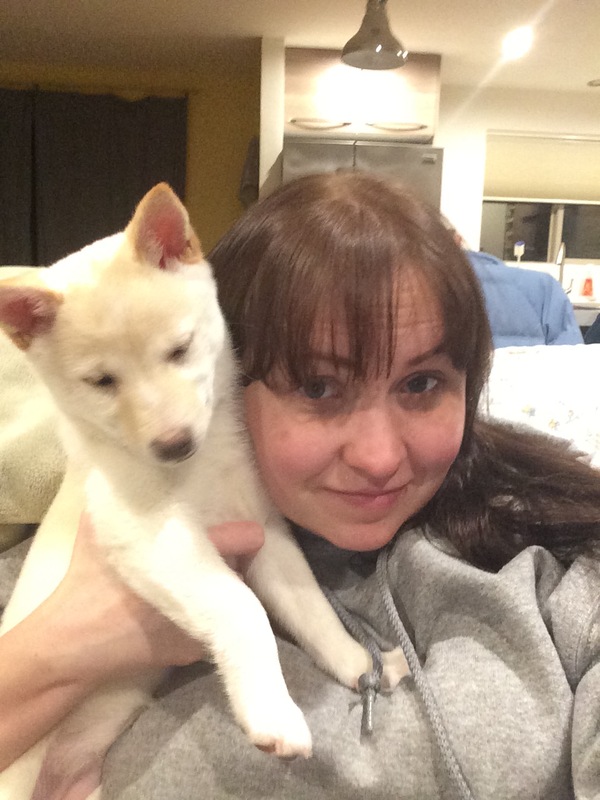 The Shibas also like to lick it off me, which can be a little creepy. I have to be careful around those tricksters. Some of the best gifts are experiences and love. I got a lot of that, too! This screenshot is a Facebook message from my mom 🙂 Can’t you just feel the long distance hug? My aunt surprised me by showing up at my work with gifts. What a nice surprise to see a loved one on your birthday (she also gave me an amazing orange fleece jacket)! 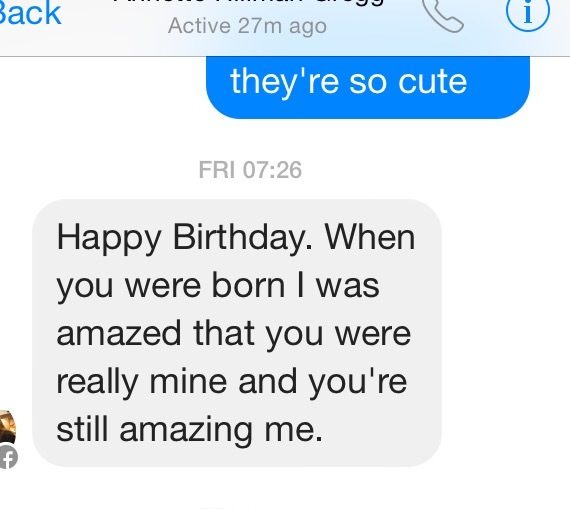 My dad called me the night before to sing me happy birthday. I’m feeling the love. By the way, isn’t it funny that my gifts are a mix of super girly and Packers stuff? That cracks me up. It’s pretty much a description of my life. My friend MK gave me this cool Packers infinity scarf, which I love! The body butter and nail polish were gifts that came with the SPA DAY that my sister surprised me with. I am not kidding you guys, she knows how to hook a girl up. She got us facials and mani/pedis, along with these spa gifts; and took me to one of my favorite vegan places (Native Foods). It was so great to hang out with her and be pampered! My boss was out of town, but sent me these pretty flowers. I also received this Kate Spade Idiom bracelet from M (likely due to my not so subtle hint in this post!). Isn’t it just lovely stacked with my other bracelets? Finally, the gift that I bought for myself- on my birthday, my adoption of Miss Riley Annabelle was complete! She is a part of our little family forever now, and I could not ask for a better birthday gift. Thank you to Denise at Shibas4Life for making it possible. A few more gift ideas: I received a magazine subscription, which is cool because it’s a gift you keep getting all year long. A coworker wrote me an email about how much she likes working with me- how sweet is that? Another coworker brought me a smoothie book because she “didn’t want to derail my diet with a cupcake”. Gestures like these don’t have to cost much (or anything), but are so special. What is your favorite birthday gift you’ve received? love, love that Coach bag! …and your puppy is totally adorable too! happy birthday! I agree that gifts should come more with thought then a blaring price tag. I love the site http://www.sokindregistry.org. The gift I love to give to my friends and loved ones is a magazine subscription. I always send the first copy filled with tabs and post-its about articles and recipes. It is my hope that this simple but monthly gift will remind them of me, while providing them a stopping point each month in their busy lives to take a moment for themselves. By the way, happy birthday. That site is a game changer. Another one that I love is https://www.birthdaydreams.org . Many of us are wrapped up in consumerism and believe the more expensive the gift or the number of gifts means we are more loved. It simply is not true. Ask any woman if she would rather receive another beautiful high end serving platter or have someone serve the little humans dinner and clean the kitchen (or better yet take them out so she can have some alone time). Hands down a smart woman would go for the latter, and remember the thoughtful gesture. The platter would sit in the pantry gathering dust. I look forward to a reading a post on simplifying giving one day on your blog! This site on giving birthday gifts to homeless children almost made me cry. That is the best gift ever. You’re right, I totally need a post on this. Like I said, you can always guest post… I am getting very motivated to give more gifts like this. Happy birthday! Sounds like you had a great one 🙂 Love the presents! Love the coach bag! So jealous of that little Riley angel!